Did you ever arrive at a much-anticipated destination only to find out that your socks were mismatched, your shirt was stained and your wallet was quietly sitting on your dining room table right where you mistakenly left it? This is what it can feel like to marketing professionals who dive headfirst into influencer marketing, but instead find themselves neck-deep in laborious research, tedious calculations, complex legal documents and unanswered emails. According to eMarketer, a May 2015 study by Schlesinger Associates revealed that though 81% of marketing professionals polled worldwide said that they were happy with their influencer engagement campaigns, 75% cited that identifying the right influencers was their biggest challenge. Brands realize the massive potential influencer marketing can have on their companies. But, once they dive in, they also discover how difficult it can be to find and connect with the right people. Though identifying and engaging with influencers can be an arduous task, it is not impossible, especially if you have the right tools and knowledge. Let’s go through some steps to finding and engaging the right influencers who can boost your brand and your sales. The industry defines micro-influencers in different ways, but generally these people boast anywhere from 1,000 – 100,000 online followers. While it may seem that finding micro-influencers would be easier than connecting with someone as popular as Taylor Swift, it is actually much more difficult. Finding micro-influencers can have you tediously combing through thousands of Instagram profiles, one by one, calculating engagement rates, researching demographics and laboriously reading through comments. Yes, it requires some work, but, your effort will not be in vain. Micro-influencers are effective because their interests are often specific and their audiences are engaged. Micro-influencers are also seen as authentic by their followers because they do not typically plug products. Who is following you on Twitter? Liking your Instagram posts? Connected with you on Facebook? Peruse your social fans and select any that have a decent following and frequent engagement on their profiles. Review your marketing personas. Where would your target consumers go to find out more about your products? Scour the sites your customers most likely frequent and look for similar profiles. Search using brand- or product-related hashtags as well. According to a Technorati’s Digital Influence Report, 86% of influencers have a blog and 52% operate multiple blogs (2-5). 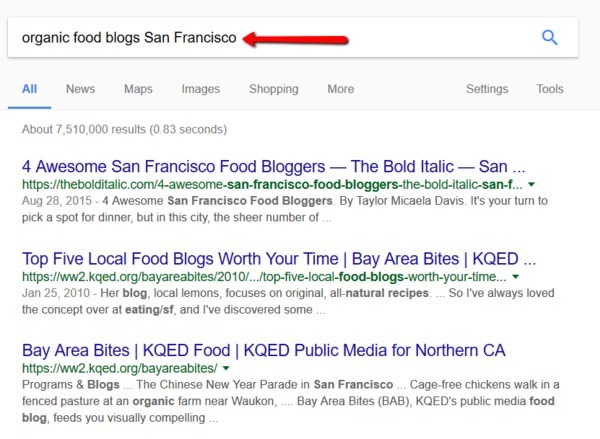 Substitute “organic food” with your brand-specific keyword and add your location, or leave it out if your brand is not location-specific. Once you’ve gathered a list of potential influencers, the next step of the identification process is to filter them through several criteria. A potential micro-influencer could have 10,000 Instagram followers but if her posts receive only a few comments and shares, you may want to pass that one up. Look for a high number of likes, comments, and replies. If you are in the health food industry but your potential influencer posts daily pics of coffee and donuts, this may not be a great fit. Ensure the influencer’s interests align with your brand. Review prospective micro-influencers’ demographics and match them with your target audiences’ demographics. It will likely be difficult to acquire demographic points without knowing these people, but gather as much data as possible. The more closely aligned the influencer is with your brand demographics, the more successful your campaign will be. You found some possible influencers, now what? Engaging potential micro-influencers can be tricky especially if they have never heard of your brand. One of the best ways to get an influencer’s attention is to engage with them on their social sites first and then send them an email. Also, send them a message on the social site where you found them and let them know you sent an email. If after a few more followups you do not hear back, it may be time to move on. If you are unsuccessful, develop closer relationships with the micro-influencers before reaching out via email and messaging. If you’re interested in achieving better results with your micro-influencer marketing efforts, a specialized platform may be your answer. On the TapInfluence platform, we typically see acceptance rates of over 80% from influencers when brands reach out to them. This is because our database includes thousands of registered, vetted, experienced influencers who are waiting for an invitation, rather than feeling bothered by brands they don’t necessarily want to work with. Our software also simplifies the process of finding micro-influencers, saving your business time and money. Simply search for relevant influencers, and you get a comprehensive 360-degree picture of the influencer based on 35 critical criteria and get real-time cost per engagement (CPE) data. The CPE metric gives you a picture of the value each influencer provides so you can compare, at a glance, which influencers will result in the greatest ROI for your campaign. The cost per engagement metric is a real-time calculation that includes data on influencer engagement such as clicks to brand URLs, likes, comments, retweets and more. It also provides data on how each influencer compares to others like them. The CPE metric is updated continually as influencers complete more assignments so you will always have a clear picture of how each influencer can positively affect your ROI. Use the CPE data in your influencer search to achieve the most value for the lowest cost per engagement. Our powerful solutions combine the best data-driven technology and our professional expertise on how to leverage the software so your campaigns result in the best possible ROI.